If you are considering buying a business for sale, you are about to embark on a great adventure. Every successful adventure begins with a mountain of questions. This enhanced eBook starts by answering many common questions and concerns individuals and couples have about buying a business for sale in Canada. Included is a list of valuable resources specific to buying a business. Included is a Case Study - a detailed discussion about an actual business buying event. The purpose of this enhanced eBook is to show you what an incredible opportunity buying a business for sale really is. It is also designed to show you that you are going to need some expert help and guidance throughout every step of the business buying process. 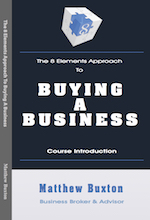 This enhanced eBook is the introduction to my complete buying a business course - The 8 Elements Approach To Buying A Business - only AVAILABLE HERE! Why I Created "The 8 Elements Approach To Buying A Business"
What Does A "Typical Buyer" Look Like?